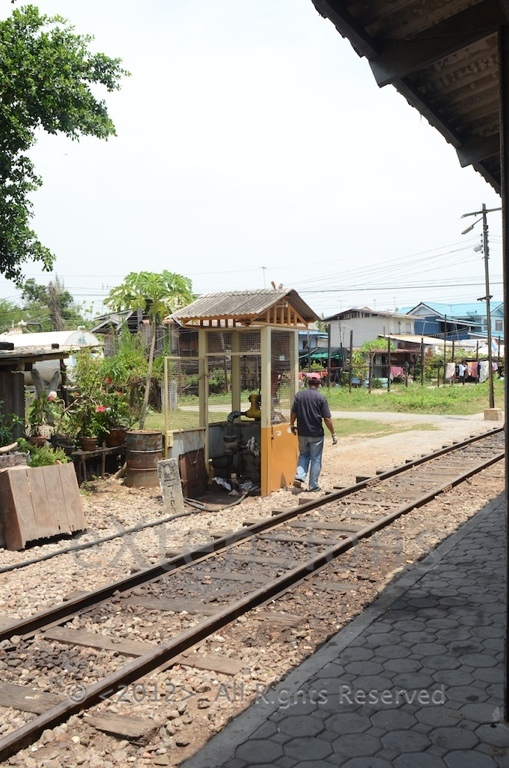 Several years ago I discovered the railway from Wongwian Yai to Mahachai. 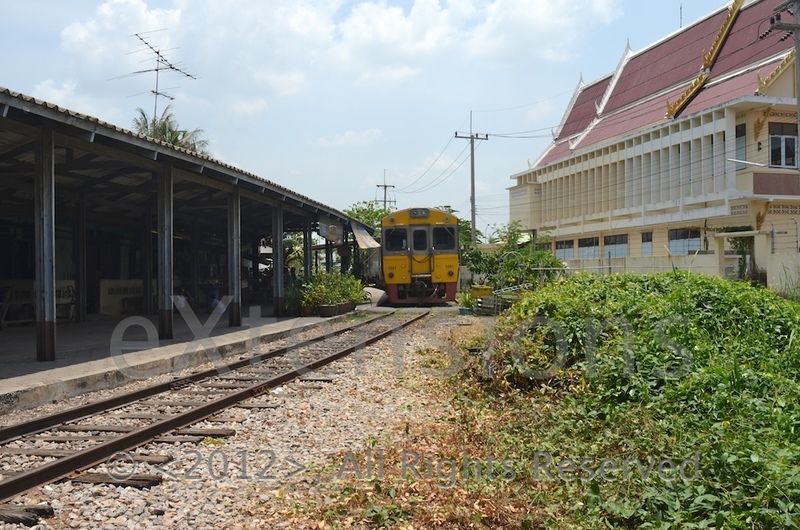 It is not connected to the main Railway system in Thailand and only goes to the next province, Samut Sakhon. 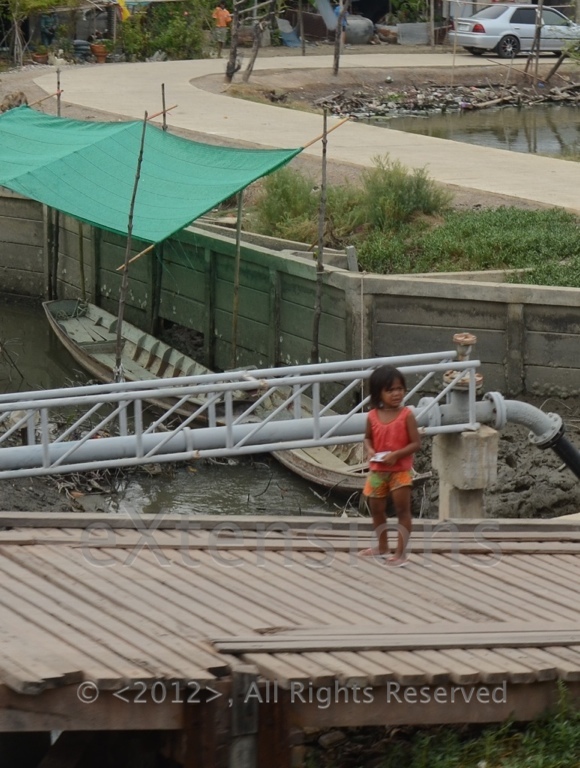 As an added oddity, there is a second part beginning the other side of the Tha Chin River that goes all the way to Mae Klong, Samut Songkhram: one line, but in two rather different parts. 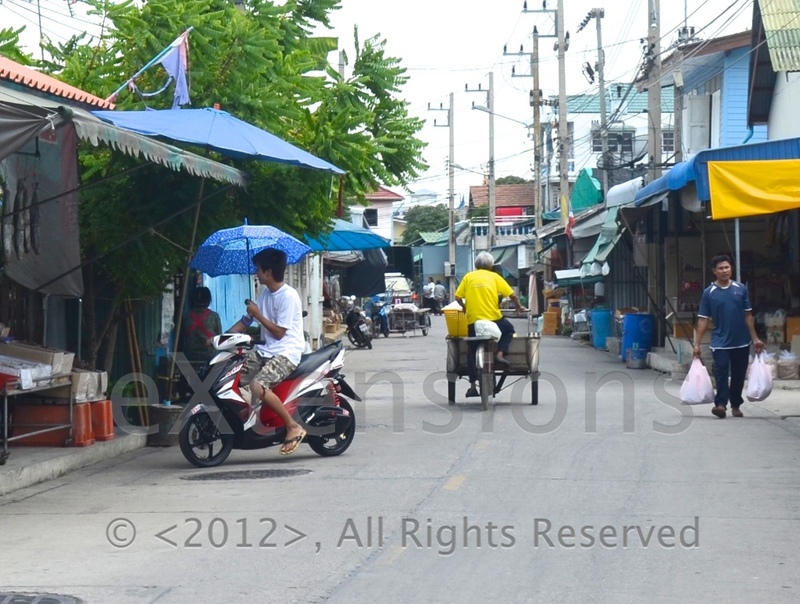 I moved to this part of Thonburi -- the Other Bangkok -- and soon found that the first section of the railway was a few hundred metres away. The trains always sounded warnings -- inbound and outbound -- with the number of roads that are crossed and the closeness of houses to the tracks. With a couple of weeks vacation, I spent some time walking the streets near here for another photography project I have been planning for a while, but also intended to use the time for an overdue trip on the railway. 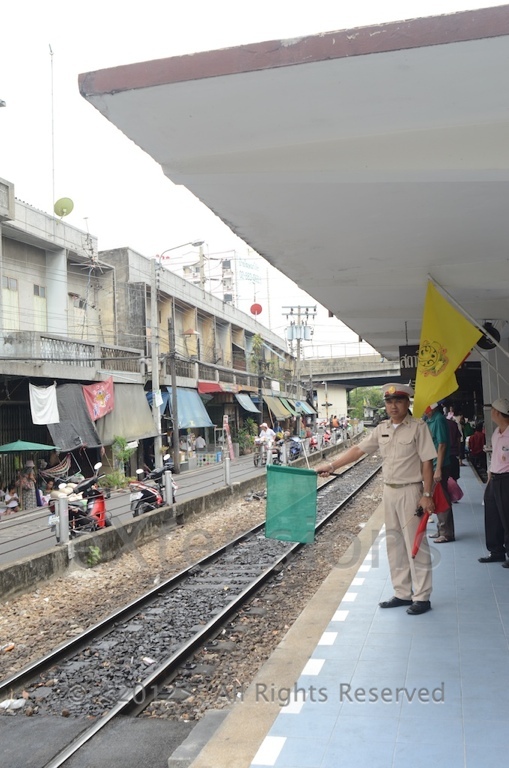 For my purposes, the 10:44 am train from Talad Phlu (10:40am from Wongwian Yai) the second station along the like would allow me to make the whole trip in one day. An update to the iPhone on the day I set aside for this went wrong for me, and by the time I had finished restoring the phone, Plan A was gone, Plan B was on the back burner and I came up with a Plan C: take a look at the first section of the line, spy out the ferry to get me to the second part, and cover the section from Ban Laem to Mae Klong a second day. In retrospect, for my purposes, which included photo editing and writing about the journey, this was a better decision. On the second day, I put the original Plan A into action and caught the 10:44 am train from Talad Phlu. Although it was a public holiday -- with the Ploughing Ceremony taking place at Sanam Luang -- there were still a fair number of souls traveling on the Mahachai line. I was able to get a seat as there was an extra car tagged on to the 4-carriage unit: something Bangkok's BTS never does, despite its sardine-can comfort. Ventilation in the carriage was helped a lot because as well as all the windows, some of the doors were left open too. This was just as well as the side seat I sat on was just above one of the engines and heat rises of course. It was also just my luck that the fan situated above my seat was the only one in the cariage that was not working. This time on the Mahachai line, rather than seek out photographs I just sat back and relaxed in the motion and the clickety-clack of the wheels. The heat helped with the relaxation too. At one time I was reminded of Fellini's Amarcord when the air in the carriage was filled with what looked like dandelion seeds for a short period. At Rang Pho we waited for a few minutes while another train -- headed for Bangkok -- pulled in on the second line here. Then we were off, slowly over the points, and back onto single track. 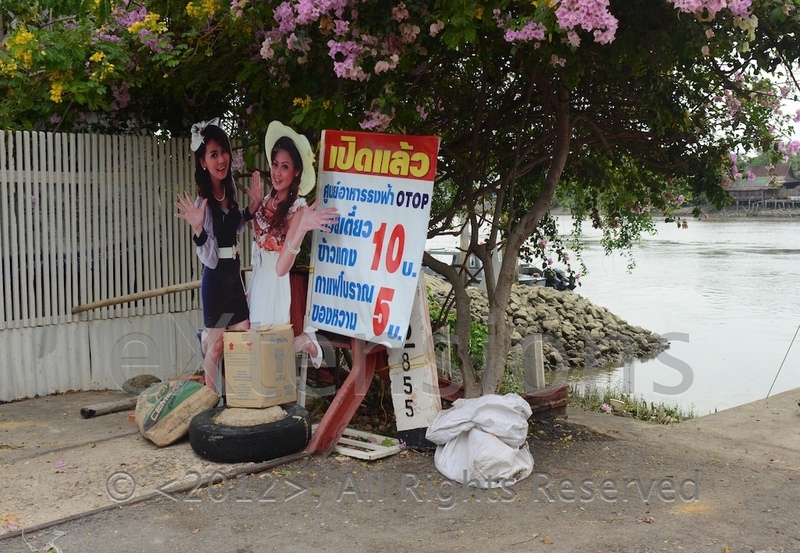 At Mahachai, I was arrived at the ferry within a few minutes and bought my 3 baht ticket. 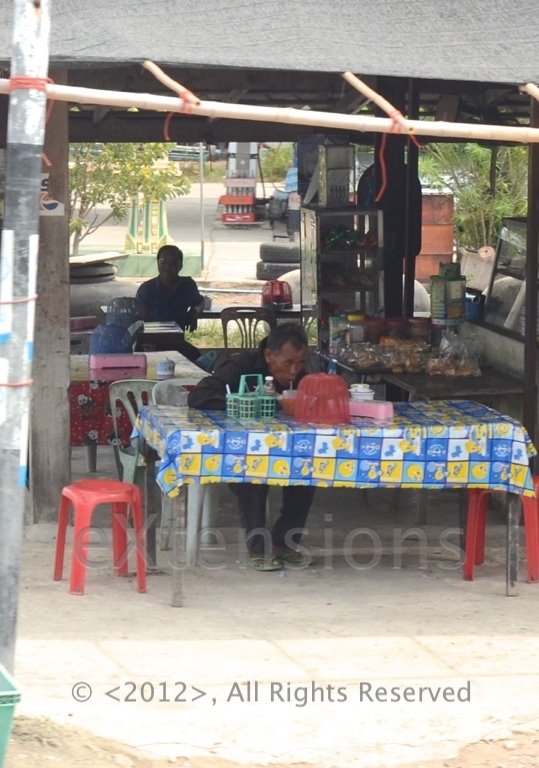 A helpful local asked me, in reasonable English, if I were going to Ban Laem. 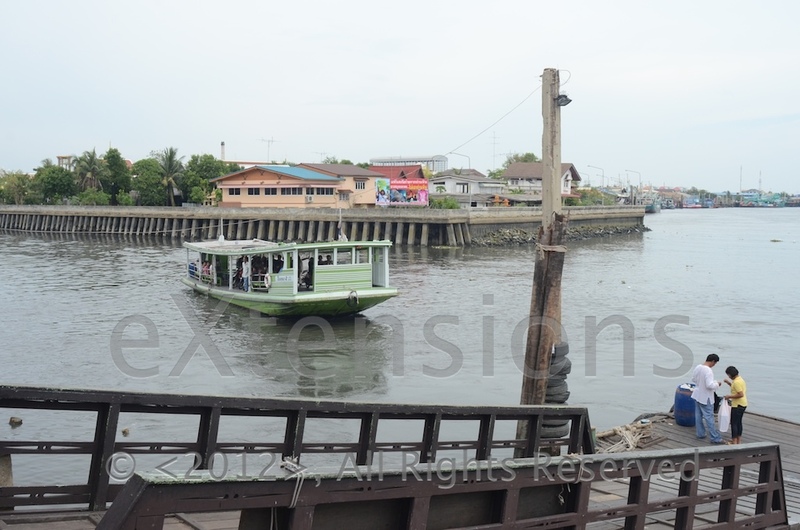 He told me there is a second ferry for that as the station is not directly across the river and is about 1 kilometre downstream. There would be a boat in about an hour he told me. 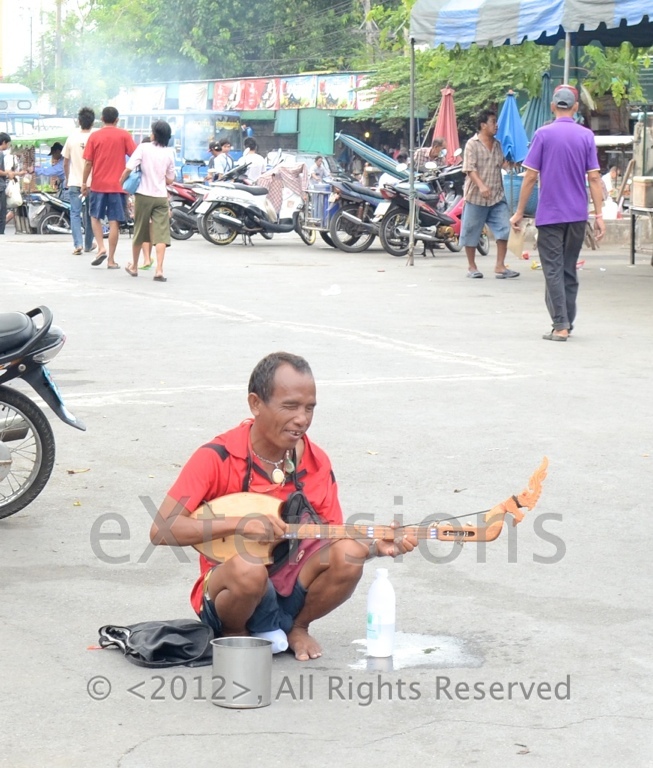 Rather than risk missing that through lack of local knowledge, I thanked him and said I would walk to see the area. I had plenty of time. 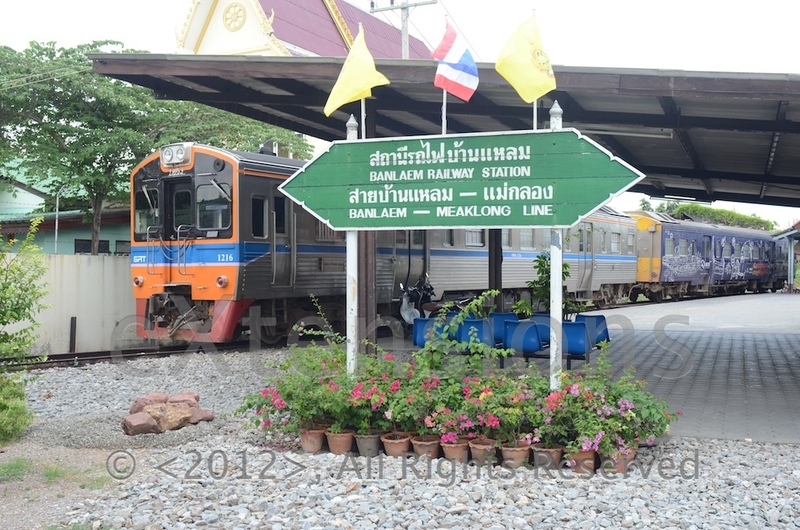 While the run to Mahachai has 17 trains a day each way, the other line from Ban Laem has only four down and four up. The two lines do not synchronise at all. Arriving at Mahachai around 11:45, I had until 13: 30 before the next train. 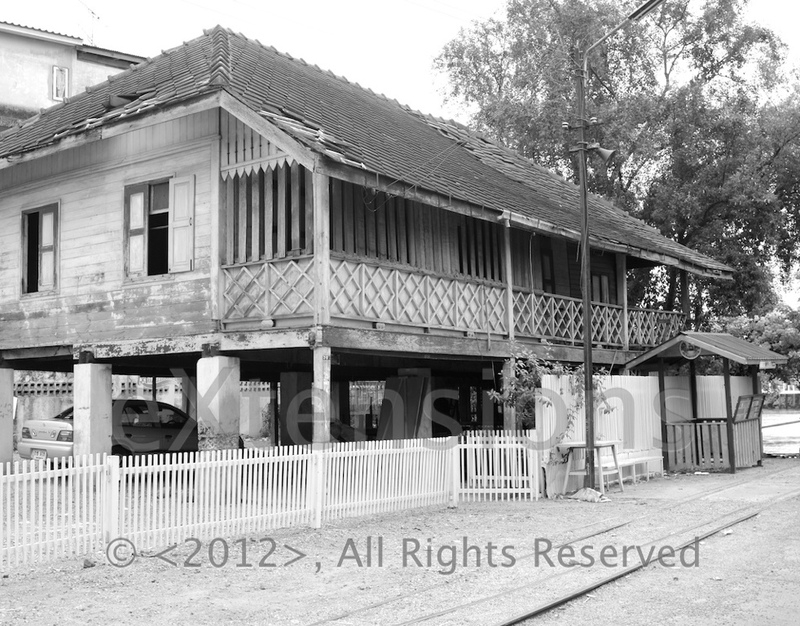 That would make its journey, wait an hour and then -- the last train from Mae Klong -- would come back at 14:30. A search on Google shows there are a few hotels within a short distance of the station. 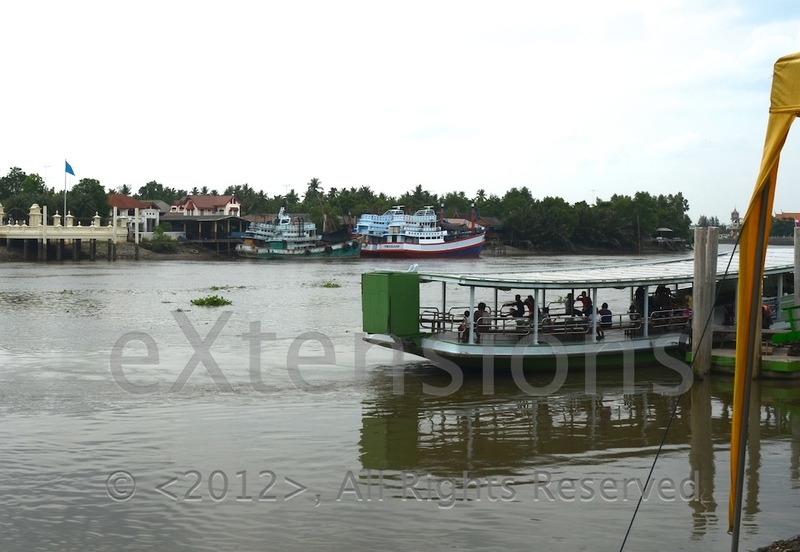 The ferry trip across the Tha Chin river was only a couple of minutes. As well as walking passengers like myself, there were also riders of light motorcycles. 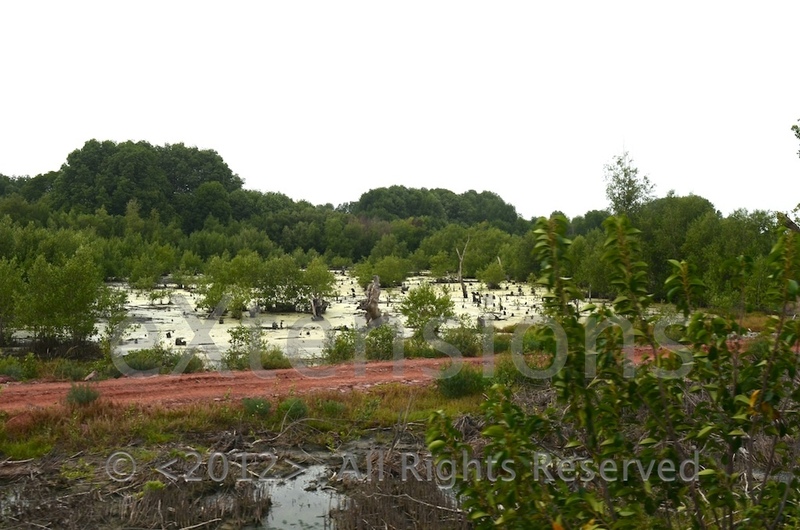 The water was low and grey, mud banks were exposed. 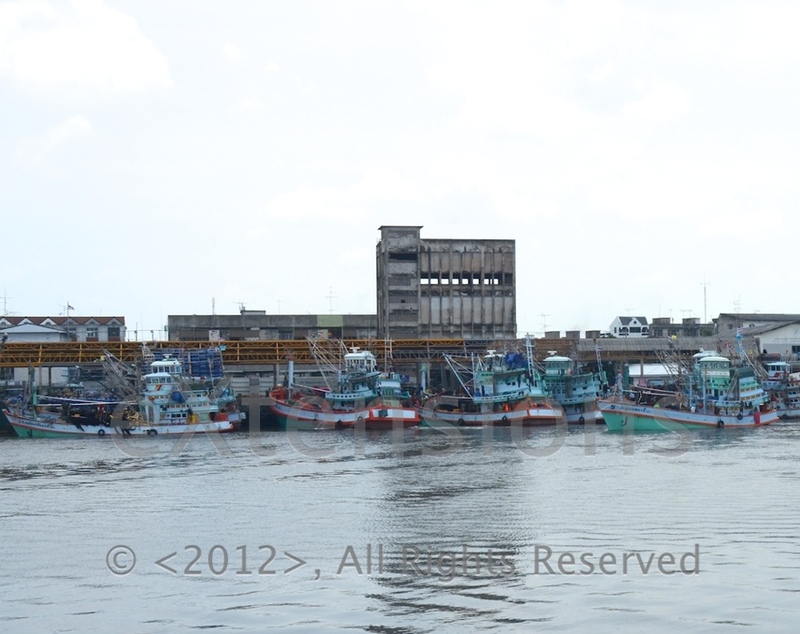 The width of the river here (and presumably the depth) was evident by the number of large ships docked as well as the sizable fishing fleet. 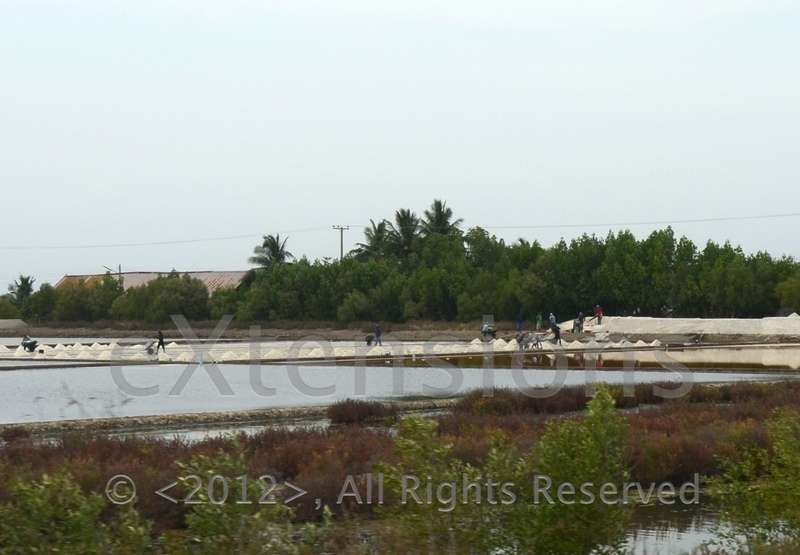 This in turn gives rise to the large number of fish processing factories in the area. 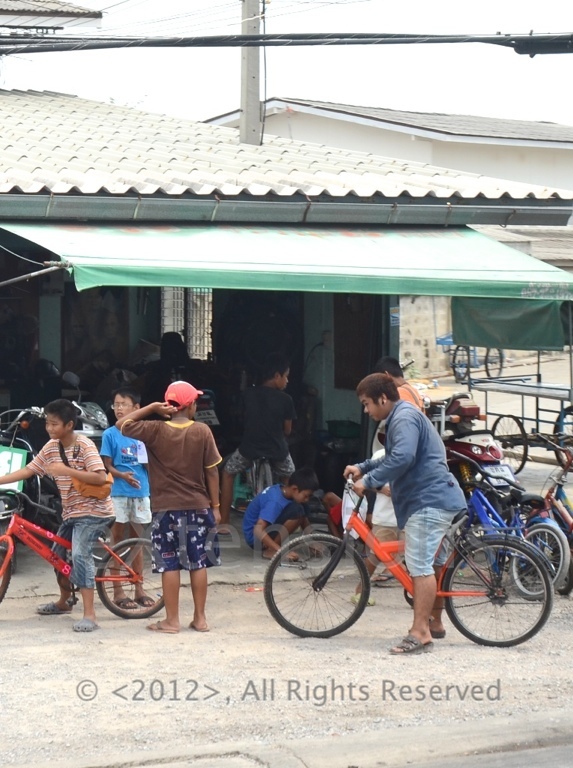 Both the fishing and the factories bring in a large number of people from other parts of Thailand as well as neighbouring countries, like Burma and Cambodia. 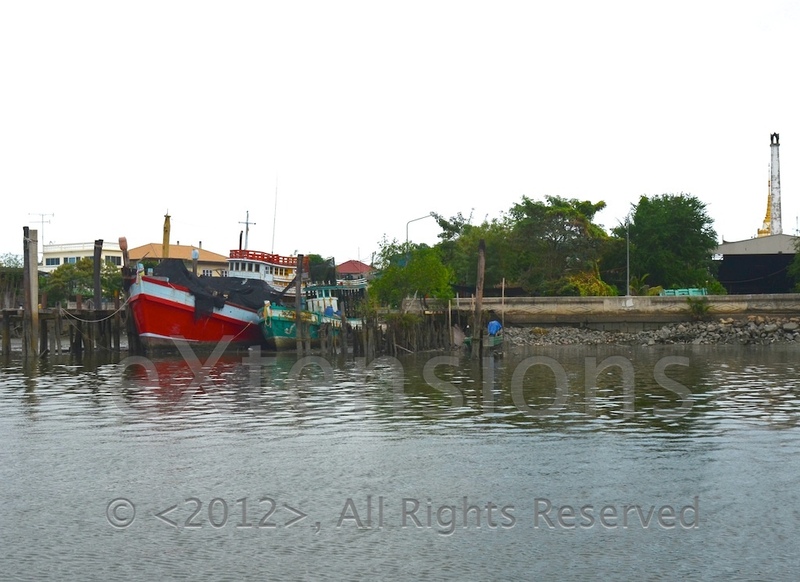 Across the river, the motorcycles roar up the gangway and those walking, like me, follow up slowly behind. The ferry deposits its passengers at an arcade. 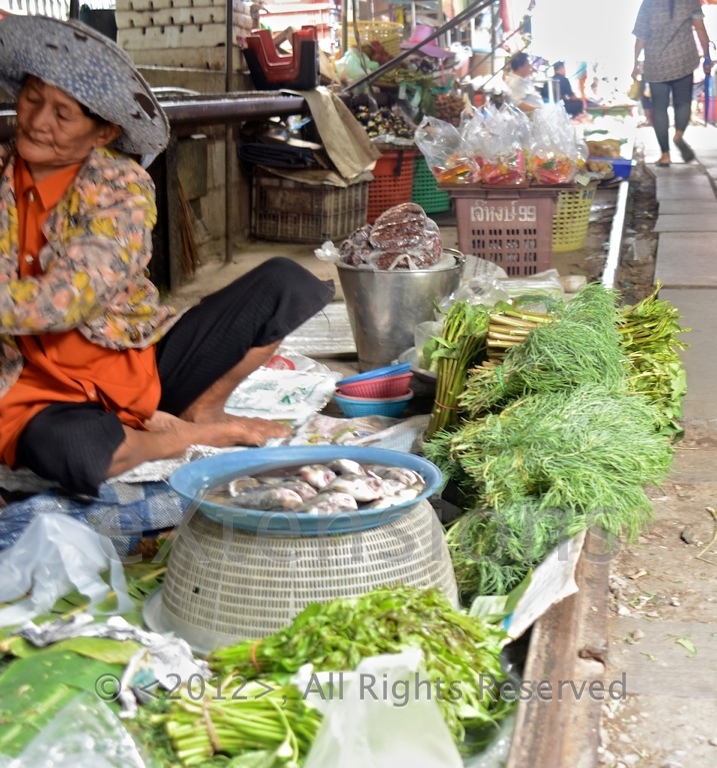 Like the Mahachai side, there is plenty of fish for sale here, but nowhere near as many people. As I leave the arcade I ask a lady selling drinks about the train. I was obviously not the firs to ask and both she and a customer gave me some basic directions in English. Out of the arcade, turn right, keep walking. It took about 20 minutes or less. 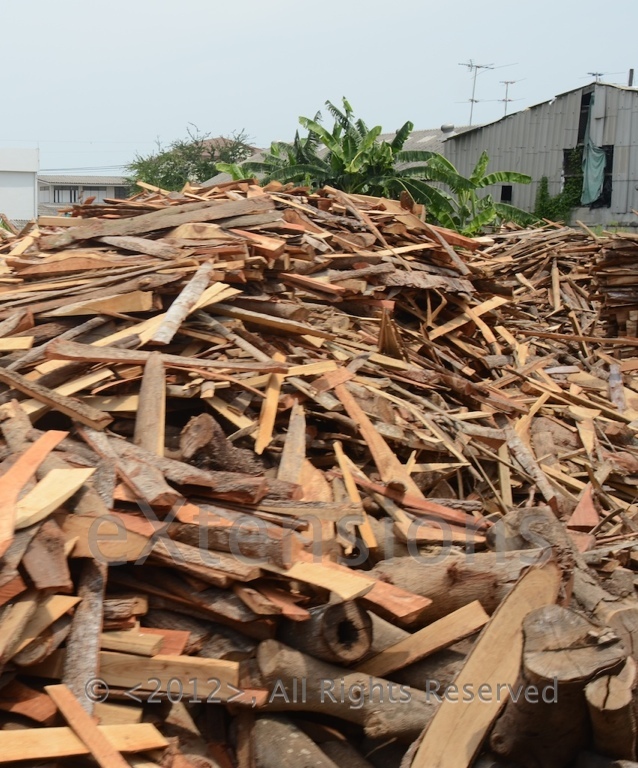 As the road turned to dust, I could see the tracks and other railway furniture. A few metres further and I could see the single track and the platform. A train was at the far end, but it was not in service. Another out of service train was behind. 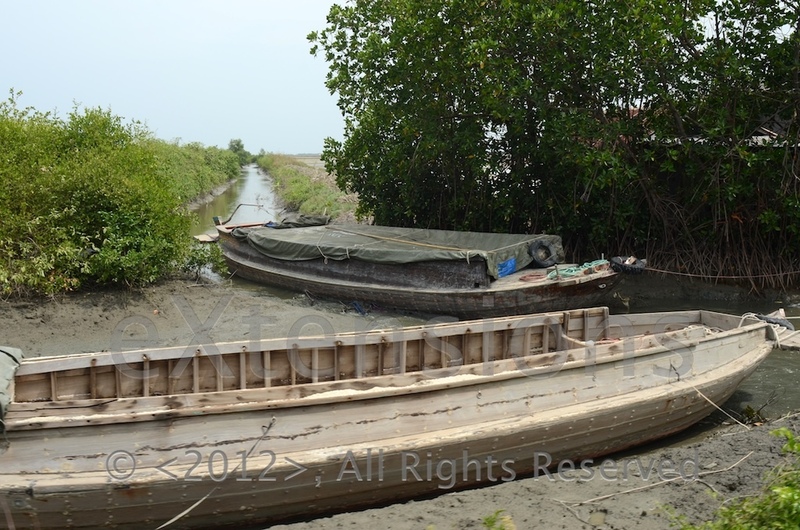 Apart from locals, there were only three or four people there. 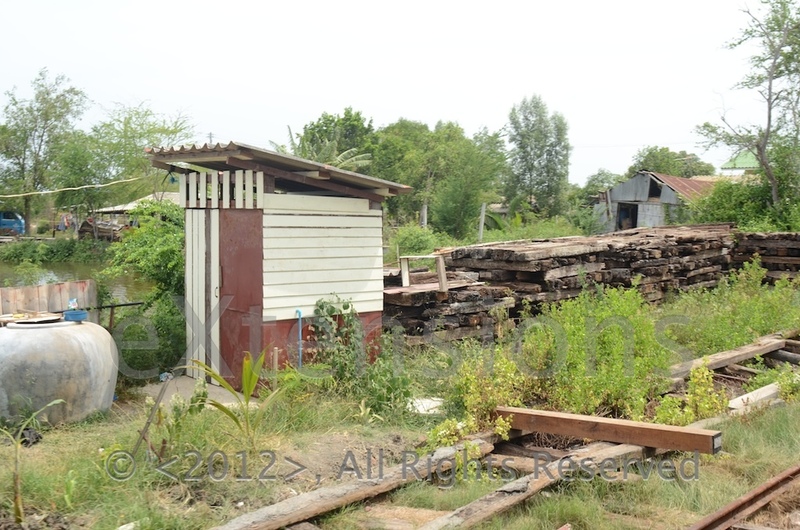 The platform was shaded -- the roof supports were made out of old rails -- and there were a couple of shops. 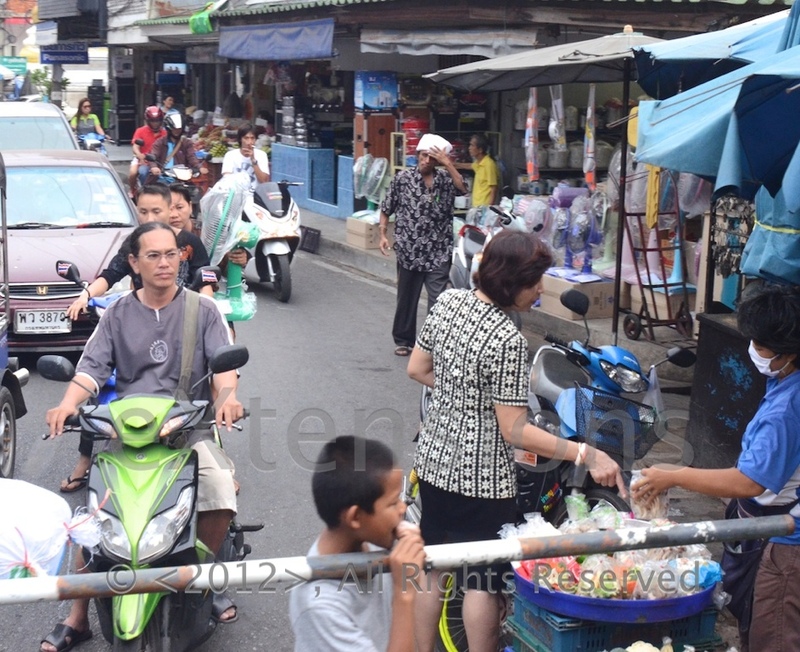 It was a different world here: slow while Mahachai was frantic. 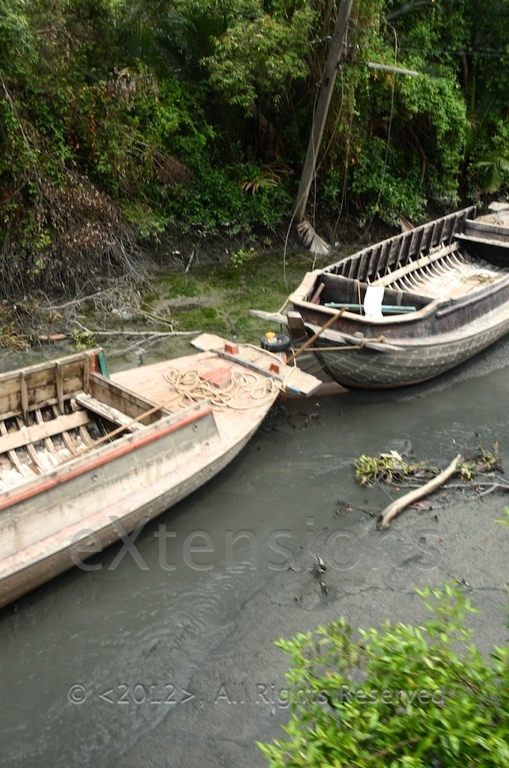 Although this line too had been constructed to carry fish to markets, there was little to show that this had been its function apart from a couple of rusting trucks. 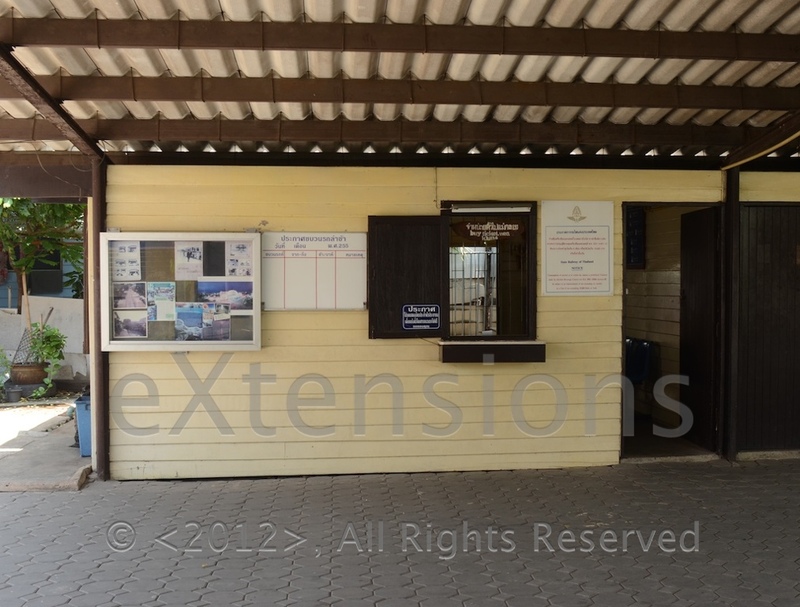 At the far end, near the river, was the office opposite the end of the track. After a few minutes looking around, I walked back to the shops and had some lunch. It was all very relaxed with no pointed enquiries and a quiet level of conversation. An old lady there helped me when I was finished and took the plate from me. When I came back three hours later, she was still in the same position on the bench. I bought a ticket, but there was still another 45 minutes before the train was due to depart. I sat on a bench and waited. One of the railway staff came out and chatted to a girl he recognised about the time the train was due. Like the trains near my apartment, I heard it arriving long before I saw it. One of the staff unhooked a fuel line beside the track as the train came closer and a few people began to appear on the platform. A 2-carriage train arrived. The front (the way I was going) was in the same Tourism Authority livery as one of the out of service carriages. The rear was the same as the second one. 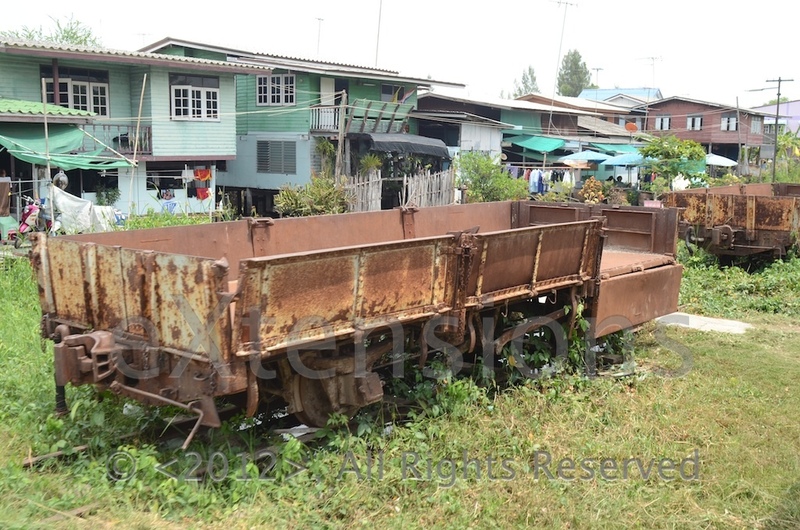 There appears to be a certain amount of cannibalisation here, and throughout the day I only saw these four units unlike several I had seen on the Mahachai line. When the train arrived a few people got off. Fewer got on. There were several spare seats. With only 4 trains a day, there is a far lower level of investment here (far fewer people too) and the line is in sore need of some cash injection. 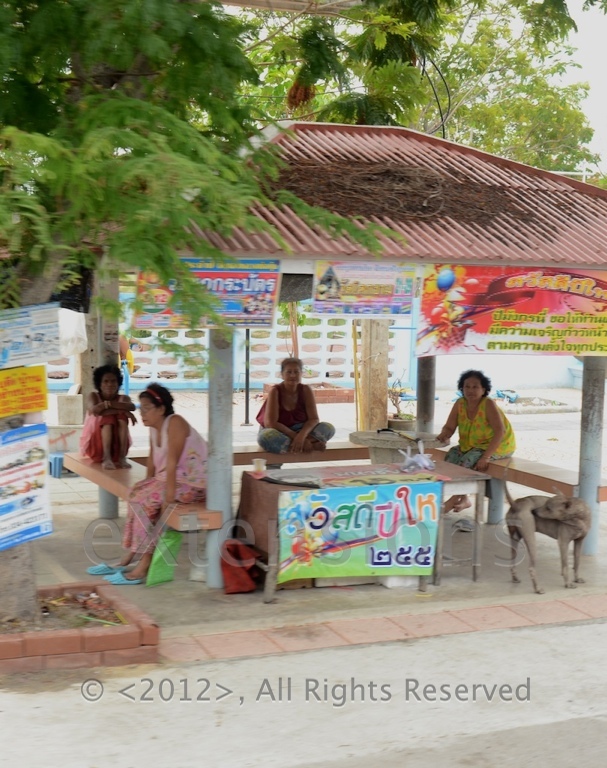 When the train left Ban Laem it moved really slowly and -- like its arrival -- the horn was almost continually sounding. 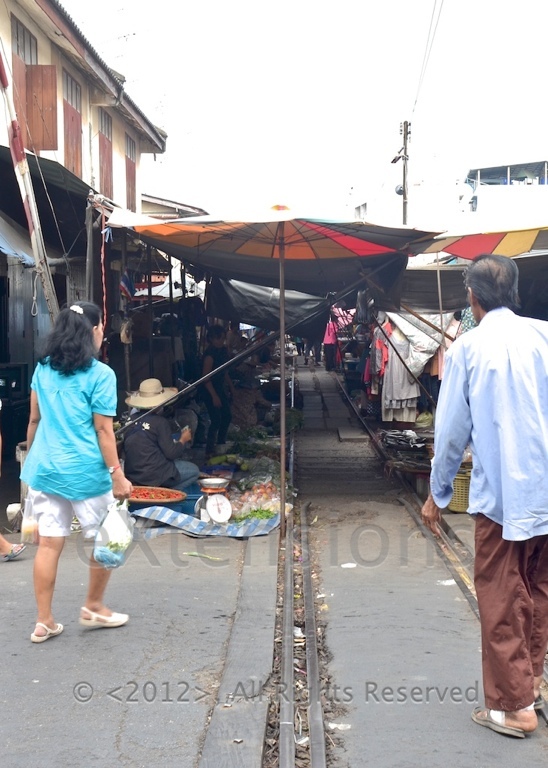 Like the line near my apartment, there are buildings both sides of the tracks, but just out of Ban Laem station they were far closer to the tracks and it would have been easy for me to have touched some of them. Vegetation too was hitting the carriage and some was entering the windows (I know it grows). At one time, I had taken some pictures and lowered the camera, only to have a branch whack me in the eye, leaving it sore for the rest of the afternoon: a quick lesson was learned of course. 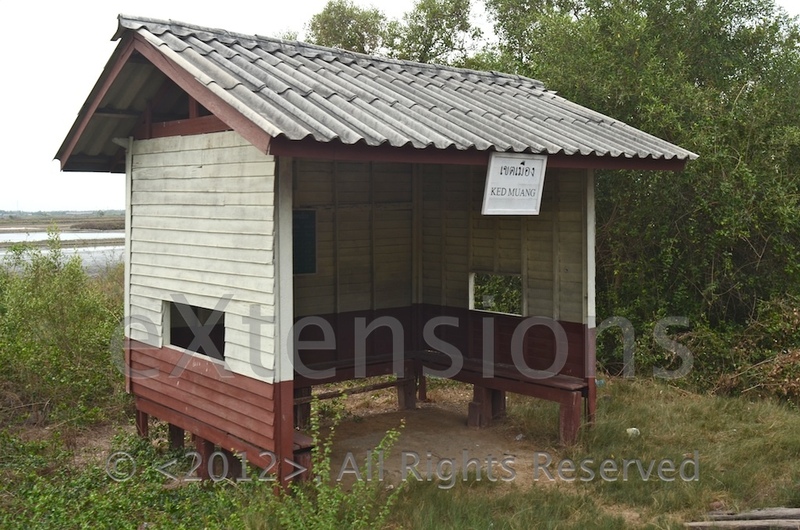 The land near the tracks was flat for miles around and with the lowness and proximity to the sea, there was considerable subsidence with the train moving at only a few KPH for long stretches. When it began to speed up, even slightly, as well as a left-right lurching, there was pronounced up and down motion from the unevenness of the tracks. The Mahachai line has only one short section where I noticed this up and down movement. 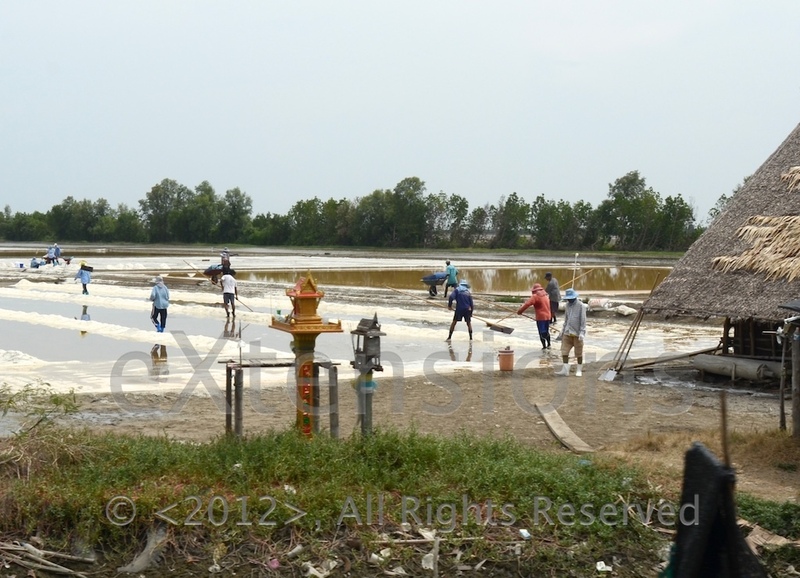 As well as fishing, Samut Sakhon has a fair-sized industry in salt production. 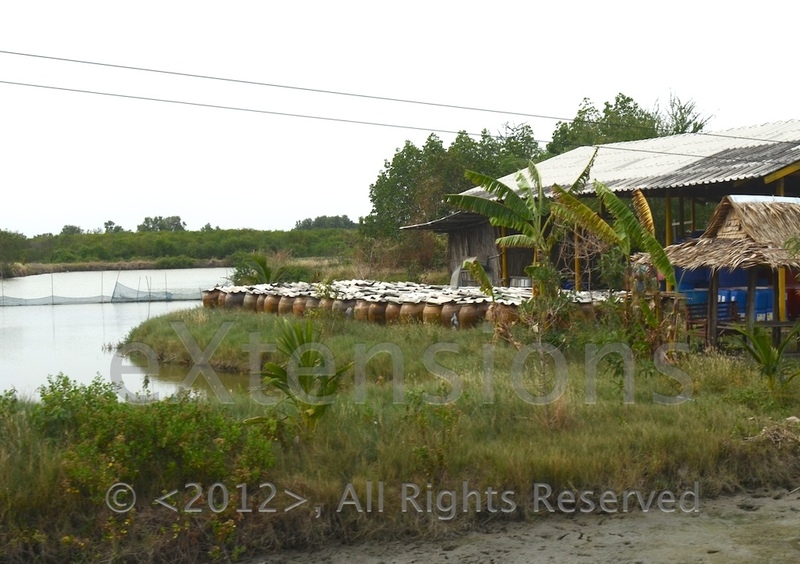 Travelling the highway to the south out of Bangkok, the salt flats are easily seen during the day. These were also quite apparent from the train, with several people at work. The nature of the land too means there are thousands of birds here, especially waders, although I saw a number of doves, diving birds and a blue kingfisher. The relative speed of the train, their distance from the tracks as well as their direction as they escaped, meant I ended up with an awful lot of photographs with blurred images: I was too late most of the time. 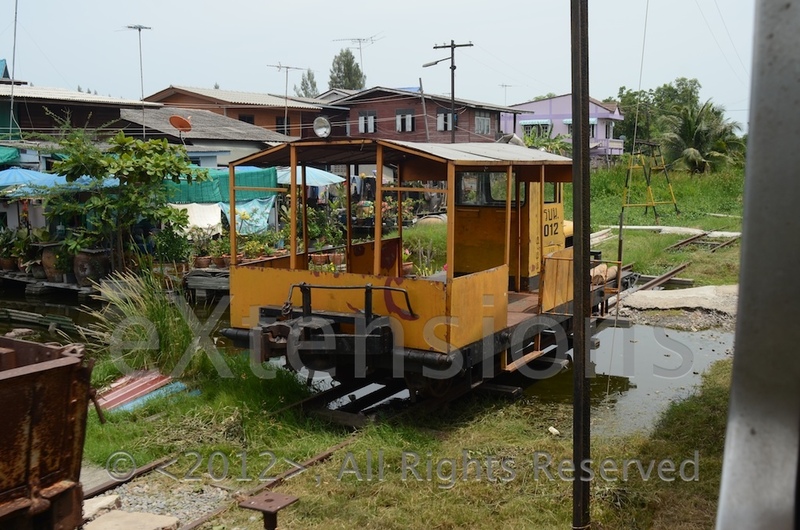 At Mae Klong the train again slowed to a walking pace. 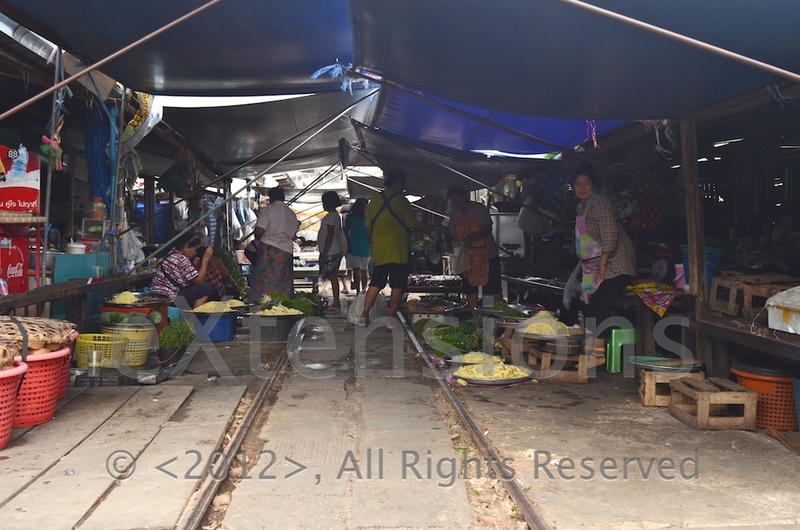 There is a market here that is actually run on the tracks. 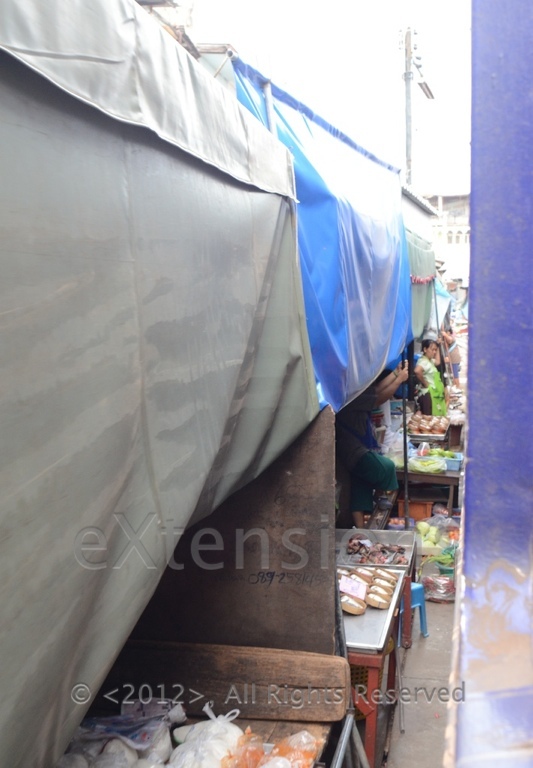 As the trains pass eight times a day (four coming, four going), the vendors clear their wares and hold back the awnings. As soon as the train has gone business resumes. 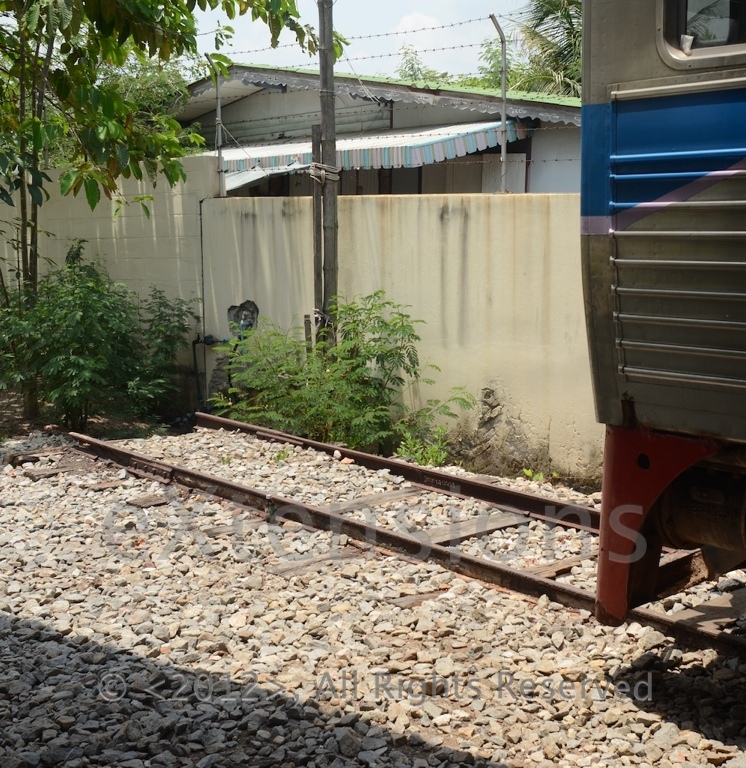 Within a couple of minutes of the train arriving at Mae Klong station I walked the few metres, across the road, and along the tracks where everything was laid out as if there was no railway at all. I had heard of this before, but to experience the sight was still a surprise. The railway company clearly does not consider it a problem. 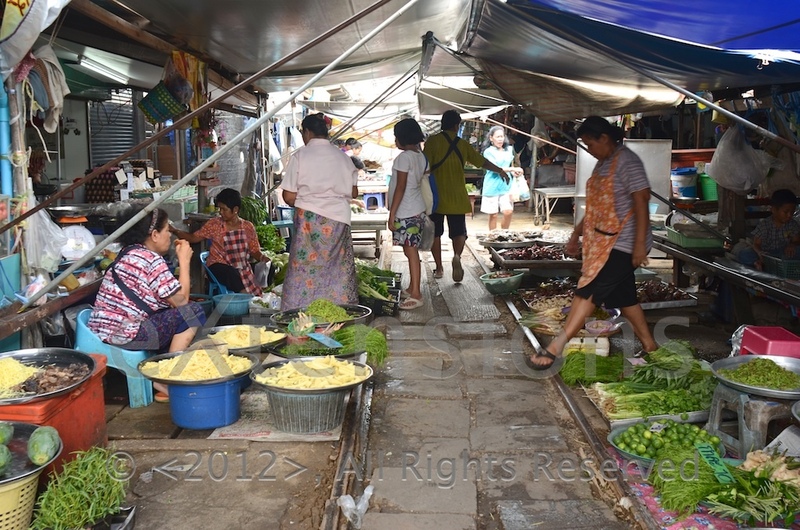 The drivers, the market workers and all the visitors deal with each train passing easily: it is an everyday event. 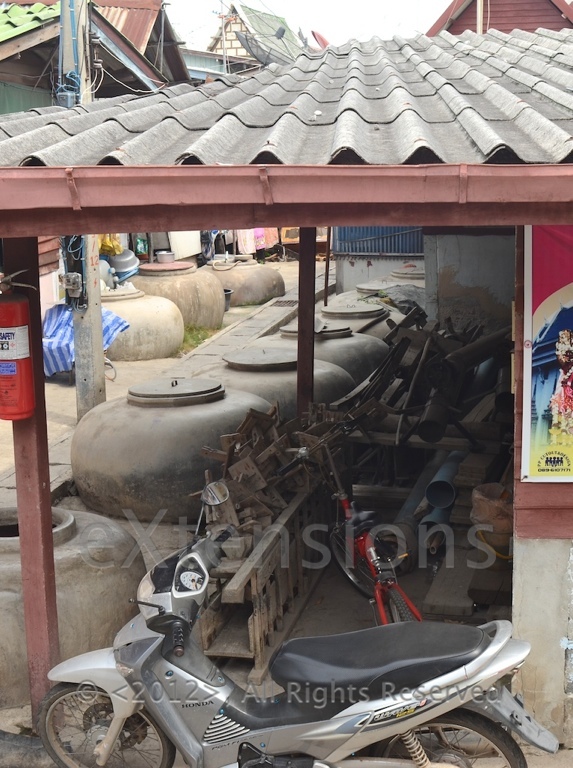 To further suggest that the market is more than just tolerated, the station displays massive posters of the market on the tracks. 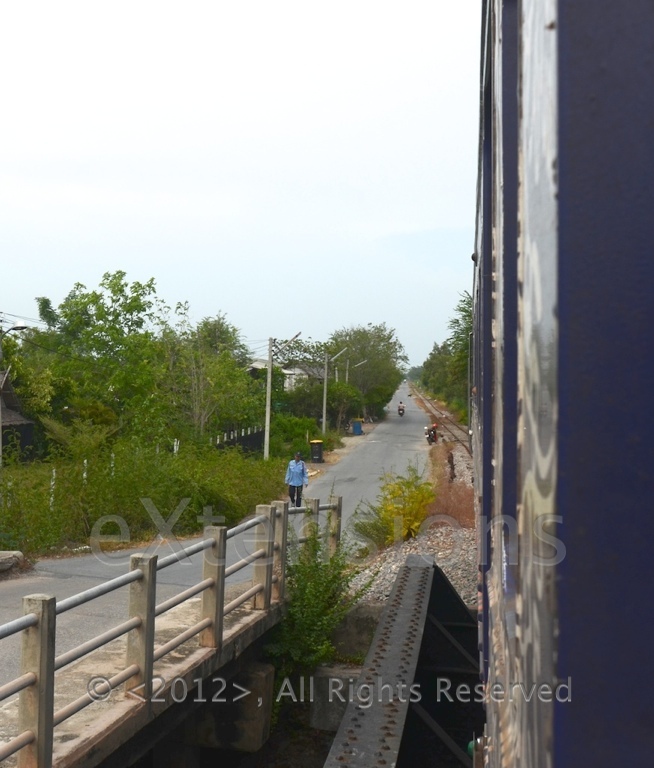 As I had at Ban Laem, I walked to the end of the track. 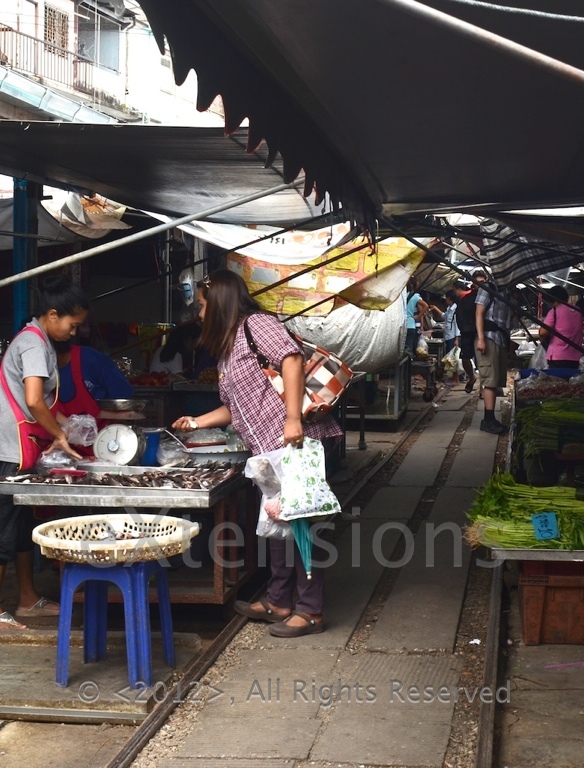 At Mae Klong there is at least a semblance of a buffer. It is just as well as there is a 5 metre drop into the river after the track ends. Even as the train arrived, people began to get on for the journey back up the track. I bought my ticket and found a seat by the window with half an hour to spare still, but by the time the train left, the two carriages were almost full. 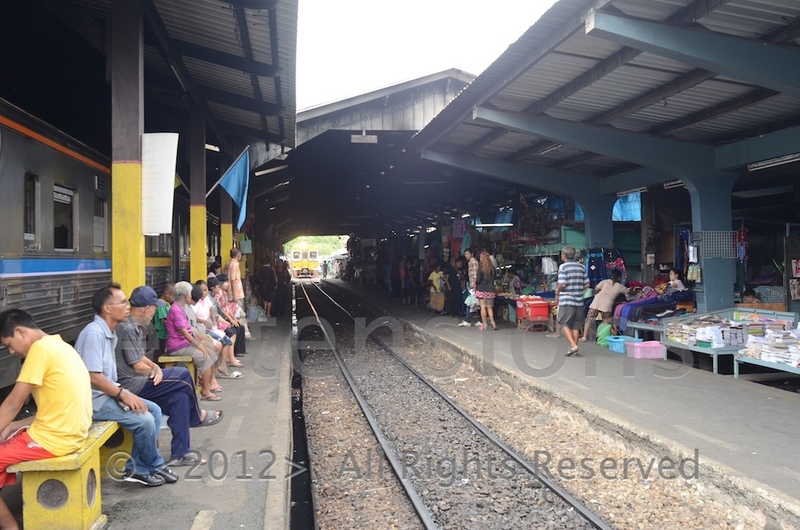 By the time we arrived at Ban Laem, there were far fewer people on the train and had got off at stations in between. 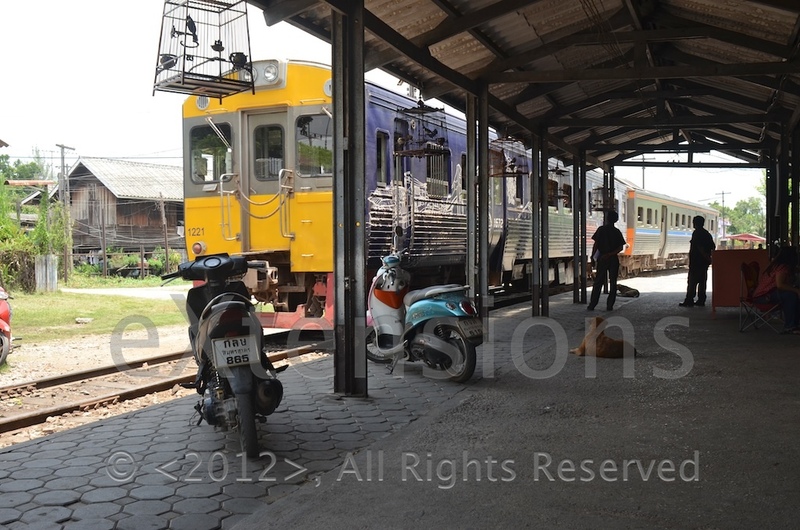 A very different service to the Mahachai line. 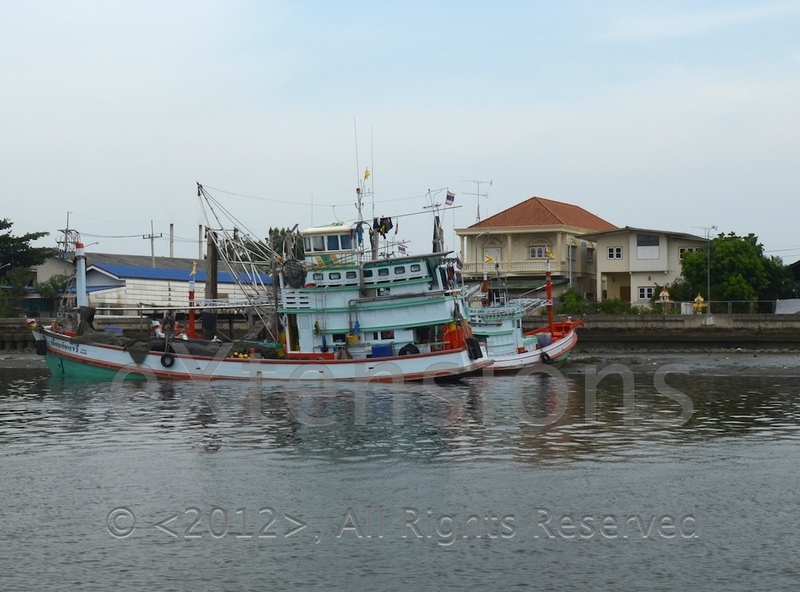 At Ban Laem I followed about a dozen people from the train to the station ferry. 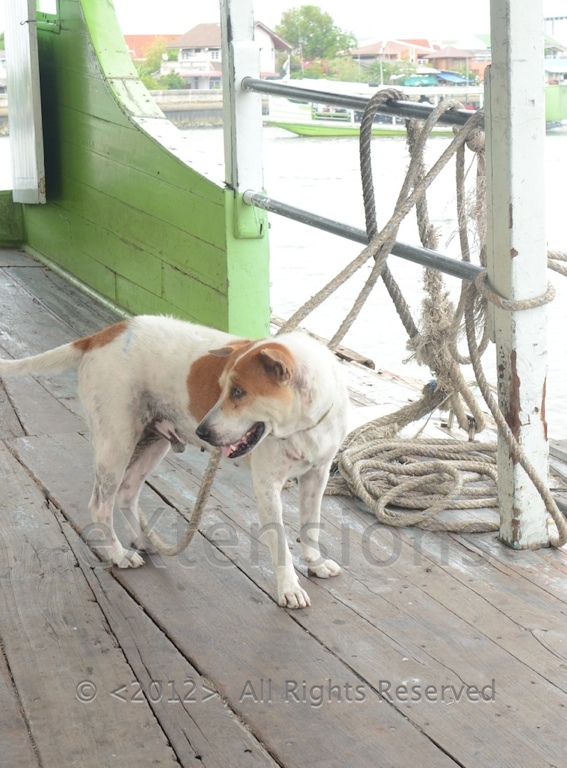 The journey took about ten minutes and we were entertained by a crazy ship's dog that played with an empty water bottle then wrapped itself in rope. Like other passengers I found this highly amusing. 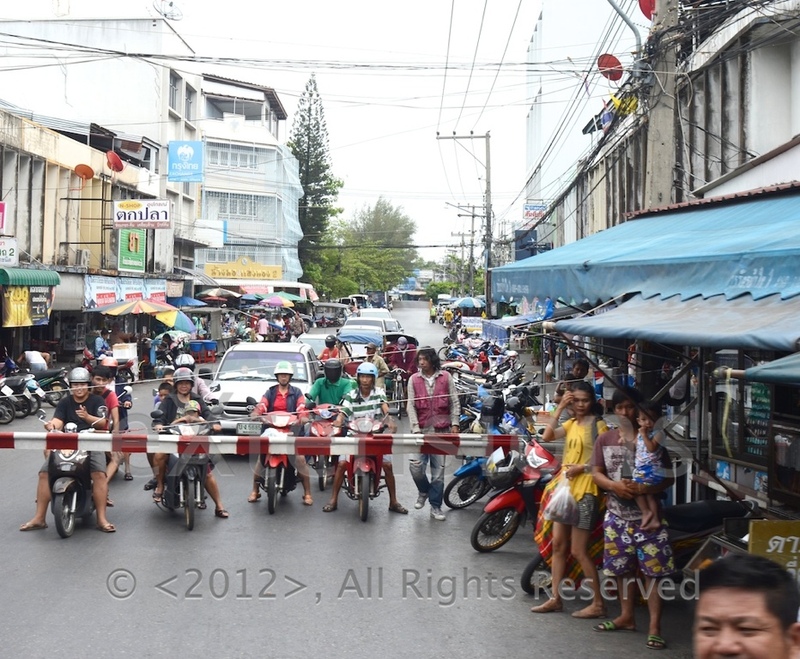 At Mahachai there were no tickets. There were free tickets for Thais as part of a government program that has just been extended, but -- unlike other stations and unlike the day before -- they were unable to sell me a ticket and I was told to buy it on the train. I had a think and went back with the old tickets I had and a picture of the ticket I had bought the day before (I scanned it on the iPhone using Genius Scan). 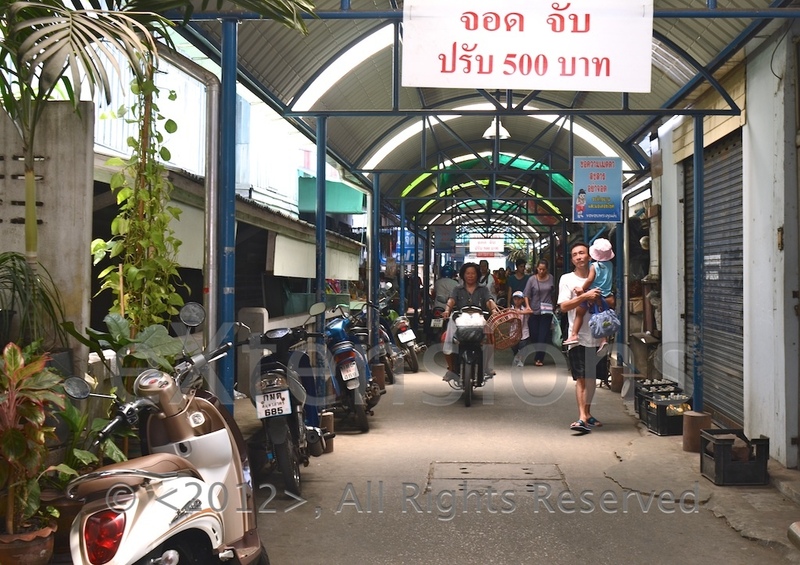 They were impressed with this and realised I could speak Thai, so explained a little more, telling me that they could not print a ticket as the connection to the network was now closed. I was still dubious but had my 10 baht ready when the inspector came round and I was given two 5-baht tickets. I arrived back at Talad Phlu around 18:30. Although there were a lot of gaps when nothing was happening, it was still a long day with the heat and I was not sorry to make it home in time for tea. 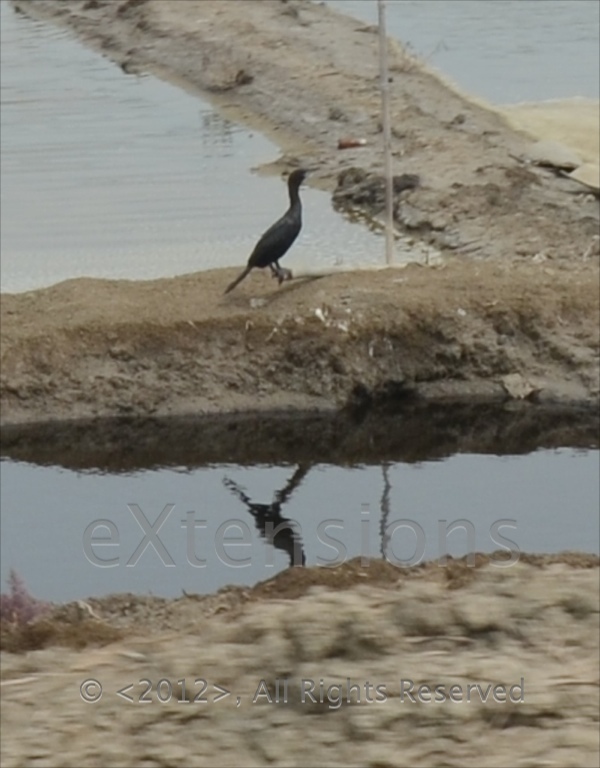 While the watermarking reduces the overall quality of the photographs, I am aware that my pictures sometimes end up on sites without no acknowledgement. I have the originals of course. These are available if wanted. 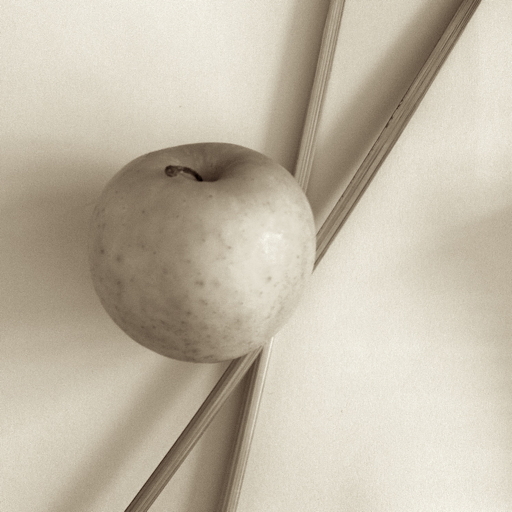 I took a total of 333 photographs with the DSLR camera I used as well as a couple with the iPhone. The large number is due to the use if a fast burst mode -- allowing up to 9 photos. Even in a second or so, the expression on a face can change. I finally selected 45 images. 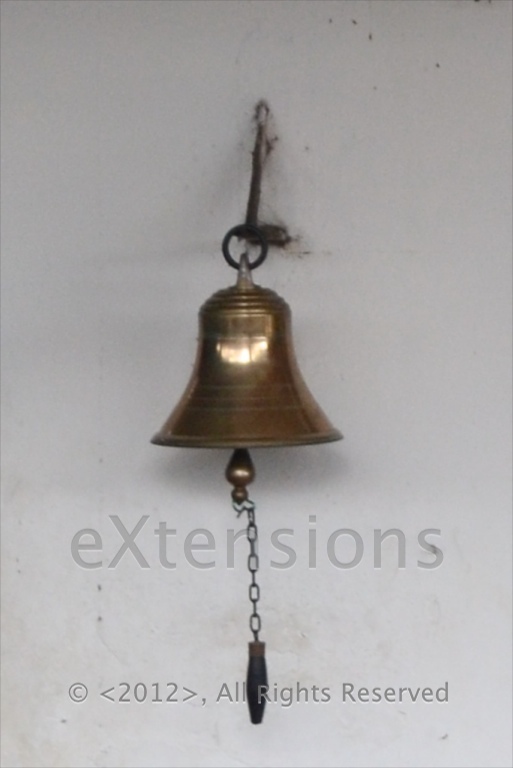 I have also added a couple from other articles. For those with a Mac and a trackpad, use Safari in Full Screen View and use two fingers to tap on the trackpad for a better display of the pictures. Please share the links.